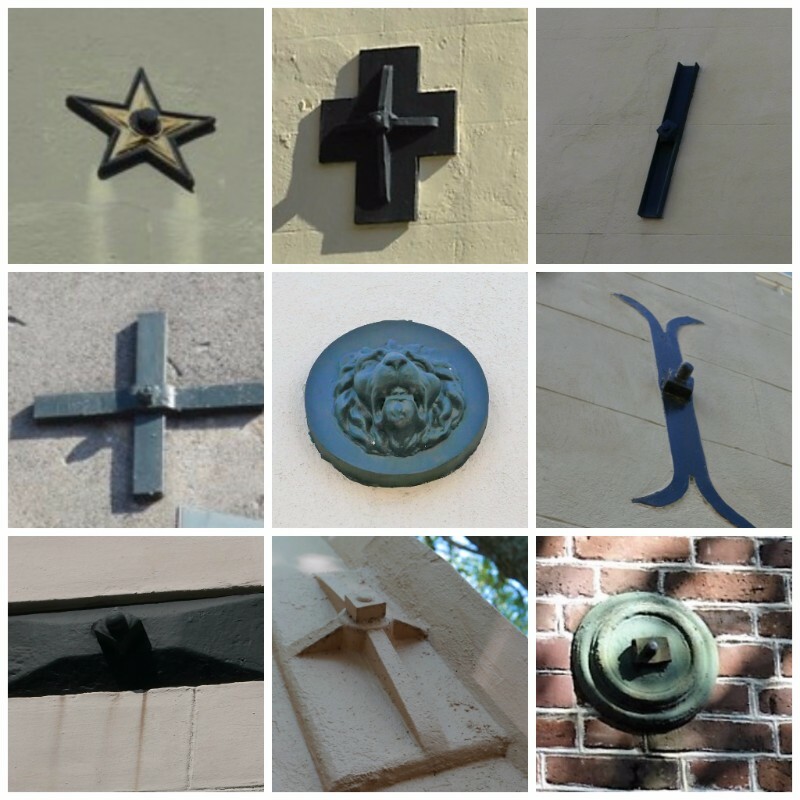 Earthquake bolts in Charleston can be seen in many different designs. A couple of weeks ago marked the 130th anniversary of Charleston's Great Earthquake of 1886. It was the largest earthquake to hit the southeastern United States and with a magnitude of 7.3, it devastated Charleston leaving its built environment forever changed. 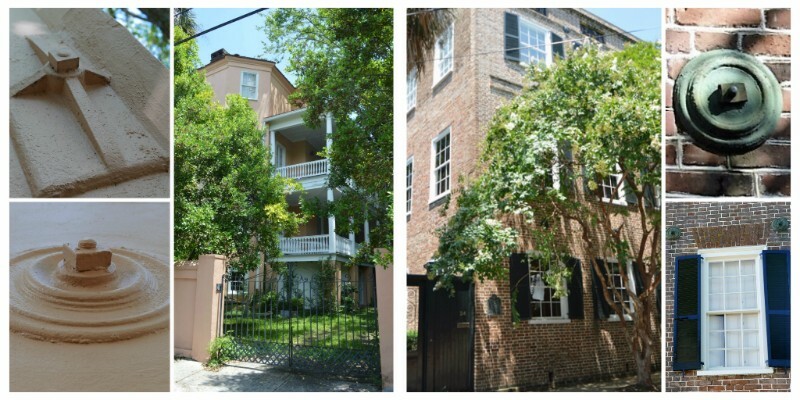 Like side-facing piazzas and distinctive ironwork, earthquake bolts are considered one of the features of Charleston architecture that make it so unique. But these stabilizing tie-rods did not actually originate in Charleston, and even in the Lowcountry they were used prior to the Great Shock. You're likely aware of the iron plates seen on numerous buildings around town, but how much do you really know about these so-called earthquake bolts? Various forms of iron reinforcement of masonry buildings evolved in Europe, dating all the way back to Greek and Roman architecture. Known as simply reinforcing rods elsewhere, the "modern" form of the technology had been in use for a couple of hundred years in Europe and America before Charleston's earthquake struck. Early American examples mimicked the Dutch short wall anchors, called stays, as part of the original building construction and used large exterior gib plates shaped to spell out the building's construction date. Here in the colonial South, the most common gib plate form was in the shape of an "S" and was used as early as 1714 when iron reinforcing rods were installed on the gable ends of Mulberry Plantation's main house as part of its original construction. 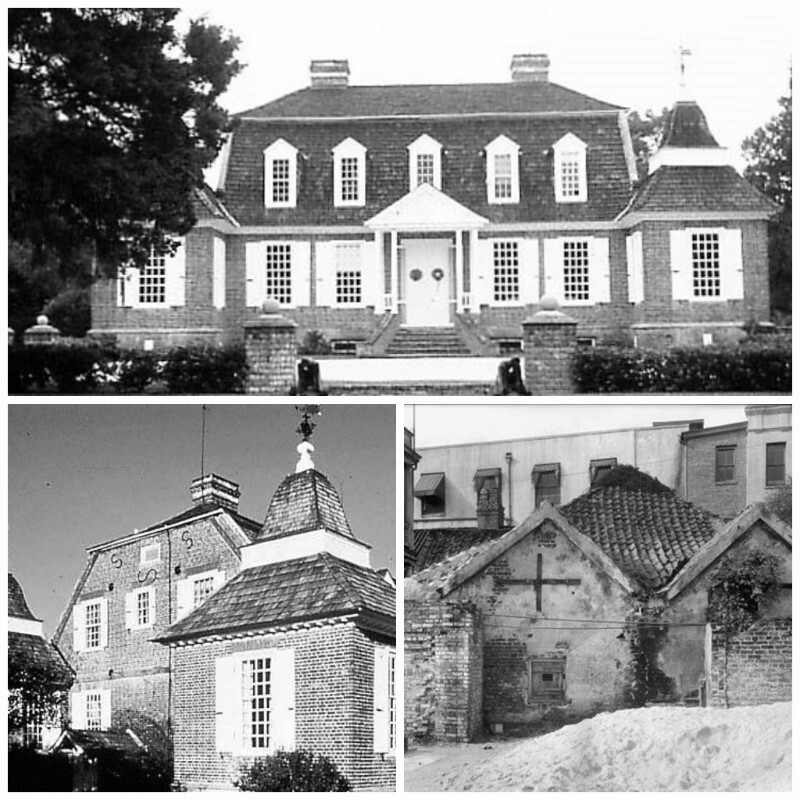 Berkeley County's Mulberry is one of the oldest brick dwellings to survive in South Carolina, and the third oldest plantation house. Damage to the dwelling during the 1886 earthquake resulted in the installation of additional rods and bolts; this time, the gib plates used were the all-too-familiar nine-inch-round iron plates. It is believed that Mulberry is the only structure that has both types of bolts: the original 1714 plates used for reinforcement during construction as well as those installed in 1886 to repair earthquake damage. Pretty cool, huh? Another example of colonial-era reinforcing rods can be seen in the circa 1713 Old Powder Magazine on Cumberland Street, where cast iron rods were capped with giant X-shaped gib plates in the 1740s. Mulberry Plantation (top and bottom left): note the "S" shaped bolts from 1714 and the circular gib plates from 1886 on the gable end. The Old Powder Magazine has reinforcing rods with large "X" plates dating from the 1740s (bottom right). Earthquake bolts were used to repair brick buildings after earthquakes struck Memphis, Tennessee in 1843 and New Knoxville, Ohio in 1875, but the only seismic-activity prone area where they were specified for new construction in the 19th century was San Francisco (surely you can guess why). In Charleston, tie rods were used primarily to retrofit and reinforce masonry buildings damaged by disasters, like the tornado of 1811 and the hurricane of 1885. Thus, some of the exterior gib plates you see around town may actually belong to tornado rods or hurricane rods, although so many were installed after the the Great Shock that they are invariably called earthquake bolts here. In 1886, about 30% of Charleston's structures were made of brick, and about 90% were damaged to some degree or another. A week after the earthquake, Henry Kittridge, a New york carpenter and machinist, recommended to Mayor Courtney that iron reinforcing rods be used to save the structures: "Most of the damaged houses in your city can again be drawn into shape and made as strong and reliable as ever, and that, too, without disfigurement, by placing heavy angle iron on the corners, and connecting rods with nuts on the end in such a way as by turning them the displacement will be remedied. These strong rods can remain hidden from sight by ornamental heads to cover them." By the end of the month, virtually every pre-1886 masonry building in the area was being repaired with the earthquake bolts, some with decorative coverings and many without. Once you notice them as you're strolling around town, you'll start seeing them everywhere! Earthquake bolts on a couple of Lois' listings: 89 Warren Street (left) recently sold and 24 Wentworth Street (right) is currently listed for sale. At least one local critic claims that Charleston's earthquake bolts were nothing but a money-making scam for some 1886 bolt-maker, but others agree that they've served their purpose in holding together many of our buildings for the last 130 years. Would Charleston's 1886 earthquake bolts make a difference if another Great Shock came around? That's a source of debate, and one that's never been tested. A College of Charleston geologist claims: "One thing we know is that on average, it's about five hundred years based on geological studies in the Lowcountry between earthquakes of the size of the one of 1886." So, we're not holding our breath to find out! How many earthquake bolts are there in Charleston, anyway? Someone let us know if you get a full count! We can point to several sets on a pair of Lois' listings at the moment. The recently sold property at 89 Warren Street has the typical round gib plates as well as some rectangular ones with a cruciform feature. The property at 24 Wentworth Street has several sets of round iron gib plates installed in the lovely brick set in the striking Flemish bond pattern. This three-story circa 1840 double-tenement home is one of Ansonborough's handsomest. Please call Lois at 843.270.2797 or email her at lois@loislaneproperties.com with any queries or to schedule a showing.